Julien Masquin, the founder of the estate has a long history in the Chateauneuf du Pape appellation. In fact, Julien Masquin was one of the originators of Cellier des Princes, the local Chateauneuf du Pape Co-operative, which is located in Courthezon. The birth of Domaine Julien Masquin dates back to 1936 when the family purchased their first vines in Chateauneuf du Pape in Courthezon. At the time, because of the depression and the lack of interest in most Southern Rhone wines, they sold their crop to negociants in bulk. In those days, it was a difficult, if not impossible time for most vineyard owners to earn a living in the wine business. In fact, the Masquin family was able to make to make a lot more money from the brush factory they owned, than they could from owning and managing their own winery. This changed at what we know of today as Domaine Julien Masquin in 1998, when Julien Masquin embarked on his career as a wine maker. In 2008, their contracts to sell to their harvest to the local cooperative was over. The new era for Domaine Julien Masquin begins with the 2009 vintage, which is when they made their debut as a wine producing domaine. With the 2009 vintage, they began producing, bottling and selling their own wines under the label of Domaine Julien Masquin. Domaine Julien Masquin owns 7.8 hectares of vines in the Chateauneuf du Pape appellation. They also own close to 16 hectares of vines in the Cotes du Rhone appellation, which are planted for both red and white wine grape varieties. Domaine Julien Masquin produces 2 red Chateauneuf du Pape wines and 1 white Chateauneuf du Pape wine. Domaine Julien Masquin Montplaisir is made from a blend of 65% Grenache, 20% Syrah and 15% Mourvedre. the terroir is rocks, stone and sandy soil. The vines come from vineyards planted in the La Crau lieu-dit of Chateauneuf du Pape. 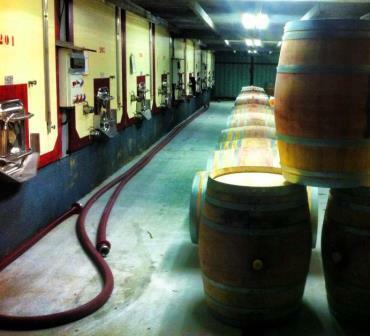 The wine is aged in foudres, used oak barrels and tank for an average of 12 months before bottling. Domaine Julien Masquin Memora is usually a blend of 60% Grenache and 40% Syrah. But the ratio of the blend can vary. The vineyard is located in the Pignan sector, not that far from Chateau Rayas, in the cooler, sandy terroir of that area. The wine is aged for an average of 12 months before bottling in foudres and tank. Domaine Julien Masquin Chateauneuf du Pape Blanc is produced from a blend of 70% Grenache Blanc and 30% Bourboulenc. The wine is aged in stainless steel vats until it’s ready for bottling. Domaine Julien Masquin can be enjoyed on the young side. Young vintages can be popped and poured, or decanted for about 1 hour, give or take. This allows the wine to soften and open its perfume. Older vintages might need very little decanting, just enough to remove the sediment. Domaine Julien Masquin is usually better with 2-4 years of bottle age. Of course that can vary slightly, depending on the vintage. In the best vintages the wine should be consumed within 4-12 years after the vintage. Domaine Julien Masquin is best served at 15.5 degrees Celsius, 60 degrees Fahrenheit. The cool, almost cellar temperature gives the wine more freshness and lift. Domaine Julien Masquin is best served with all types of classic meat dishes, veal, pork, beef, lamb, duck, game, roast chicken, roasted, braised, stewed dishes, sausage, barbecue and cassoulet. Domaine Julien Masquin is also good with Asian dishes, hearty fish courses like tuna, mushrooms pasta, eggplant, cheese and tomatoes. The white wine of Domaine Julien Masquin is best served with a myriad of different seafood dishes, shellfish, crab, lobster, sushi, sashimi, chicken, pork and veal, as well as Asian cuisine. Medium bodied, smoky and fresh, with elegant textures and sweet, red berries from start to finish. This should be delicious on release. But I would drink this before its 10th birthday. Forward, medium bodied and ready to go, if you like up-front, easy to drink, juicy red fruits and peppery spices like I do, this is a nice crowd pleaser wine. Fresh, elegant and floral, with sweet kirsch and spicy notes to keep it interesting and fun to drink. This is already showing well, so it should be delicious on release. Light, medium bodied, red fruits, with good freshness for uncomplicated, early drinking. Medium bodied, soft, elegantly styled, this delivers the goods from start to finish, with its floral, fresh red fruits and herb notes down to the plush, crowd pleasing finish. This was a new discovery for me. I'm looking forward to tasting this again in a less challenging vintage. Medium bodied, light and fresh, with a breezy, coolness to the red fruits and easy drinking, soft textures. This is really coming on strong. the debut release from this estate serves up a plush, ripe, peppery, herb filled blend with loads of sweet, spicy, black raspberries, kirsch liqueur and garrigue. The wine was made from a blend of 65% Grenache, 20% Syrah and 15% Mourvedre.